Benedictine monks from the St. Vincent Archabbey in Latrobe, Pennsylvania, made their way to Breckenridge, CO in 1886 for missionary work. Other monks followed them in ensuing years, moving from Breckenridge, to Boulder, to Pueblo and finally to Cañon City by the early 1920’s. This beautiful monastery, built in 1924, once housed up to 90 Benedictine Monks and is listed on the National Register of Historic Places. The Benedictine monks carried out three distinct functions at the Abbey , the Abbey Boy’s School, the Holy Cross College and Seminary for young men desiring a life dedicated to God and Camp Holy Cross a camp for boys ages 8 to 14. On May 10, 1923, Father Cyprian Bradley, Prior of the Benedictine Society of Colorado announced that the Roman Catholic Church purchased 90 acres of land, formerly known as Fruitmere Orchards, from Captain Benjamin F. Rockafellow estate. The Benedictines established a religious foundation and named it the “Holy Cross Abbey”. The local chapter of the Ku Klux Klan, who recognized the foundation as a threat to their Protestant ideology, and the influx of southern European Catholic immigrants into the area coal mining camps further confirmed that the local religious landscape was changing. Designed by Joseph Dillon and L.A. Des Jardins, construction began on February 25, 1924 on this massive 4-story brick building built in a modified cruciform plan. Described as Collegiate Gothic with a detectable Jacobean Revival influence, its scale and style are unique in south central Colorado. It was completed in 1925 at a cost of $600,000, three times the estimated cost. Other Benedictine Abbeys in the US helped pay the staggering cost. When first constructed the Monastery was outside of town but over the years the community has built up around it. During the construction the monks lived in the Indian Lore Building and other smaller buildings further back on the property. The monastery was built as a teaching facility thus the chapel is very modest. The original architectural rendering included a grand cathedral, electrical plant, football stadium, and many other additional buildings. Due to the Depression and WWII these plans never came to fruition. In 1926, Holy Cross was elevated to the status of Abbey and Father Cyprian Bradley was appointed first abbot, he was instrumental in getting the Boy’s School up and running. The Depression plunged the monastery into financial difficulties and when Abbot Cyprian retired in 1933, Father Leonard Schwinn was appointed administrator and did much to put the monastery on sounder financial ground. Father Leonard Schwinn arrived in 1933 and was named second Abbot on June 18, 1937, he remained Abbot of Holy Cross Abbey for over 26 years. The Abbey School- was a all boy’s college preparatory high school that operated from 1926 – 1985. Education was an integral part of the monastery since its beginning. The Abbey School opened in September 1926, with an enrollment of 35 boys, who were all housed in the new fireproof building. Enrollment more than doubled to 87 the following fall, with students overflowing the 4th floor dormitory and private rooms ground was broken on May 1, 1928 for a student’s residence hall. Ullathorne Hall was built just west of the monastery providing lodging for about 150 students. A gymnasium was added in 1928, it was later used as a fine arts building and is currently used for the Department of Corrections Training Facility. In 1935 and 1936 two small science buildings were erected (Stansbeck & Sheeby Halls). 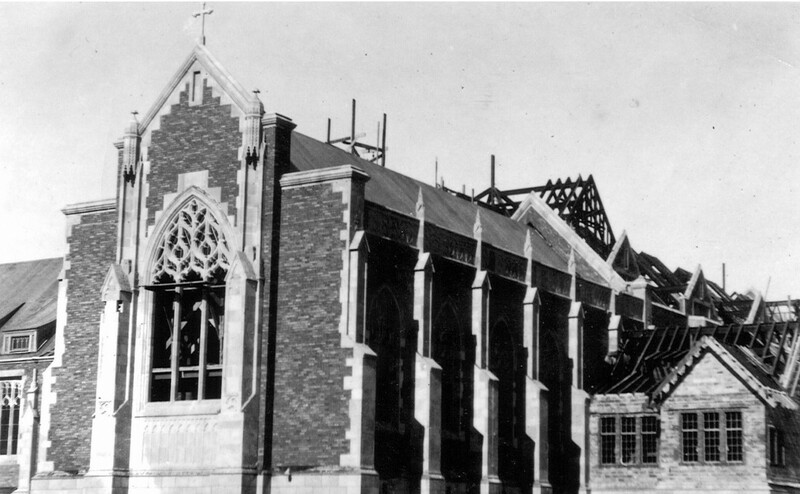 In 1949 a new field house was constructed and in 1953 more expansion began when St. Joseph’s Hall, an administration & classroom building were added. In 1956 St. Mary’s Hall another classroom building was completed. A new residence hall, Hedley Hall, opened in 1963. In the fall of 1967, 250 boys were enrolled at the Abbey School, this included 203 boarders and 47 day students. Students hailed from across the US, as well as several foreign countries, including Panama, Saudi Arabia, Mexico, Nicaragua, Kuwait, Ecuador, Taiwan and Japan. Local boys could attend school as “day scholars”. The Abbey accepted students and teachers of all faiths, creeds and races, although students were expected to attend some form religious services on Sundays. Days generally began at 7:30 am and ended with “lights out” between 10:30 or 11:00 pm. Students were required to take classes English, theology, math, science, foreign languages, computer science, social sciences and physical education. Students could take electives including photography, art, typing, geology and career counseling. In 1972, tuition, room & board for the school was $2,200, which included everything except laundry and books. Enrollment was near capacity that year with about 250 students. The event center building, originally the student union/dining hall, was constructed in 1973. In 1985, because of declining enrollment, the Abbey announced it would close the doors of the school but would continue to function as a monastery. The monastic program began a process of dissolution in 2002 and closed in 2005. The campus was sold to a private investment company in 2007. Today the the campus is over 200 acres and is used as an events complex with all types of events happening including weddings, meetings, banquets, retreats, reunions, car shows, expos, celebrations and the list goes on. The front 50 acres being occupied by the many buildings constructed over the years and the remaining acreage is farmed.